Description: Sexes similar. 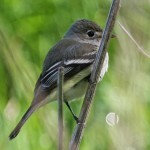 Black head; slate gray back; black tail with broad white terminal band; white underparts with pale gray wash across breast. Orange-red crown patch is usually concealed. Juvenile is brownish-gray above, and darker on the breast. 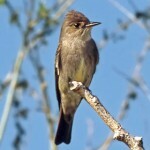 Habitat: Found in open areas with scattered trees or tall shrubs, and forest edges. Often seen in cities foraging over streets or intersections, and perching on vantage points such as street lights or telephone lines. 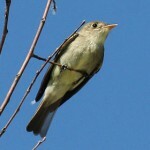 Where in Nebraska: Common spring and fall migrant and summer resident across the state. Becomes less common westwardly. Regular breeder. 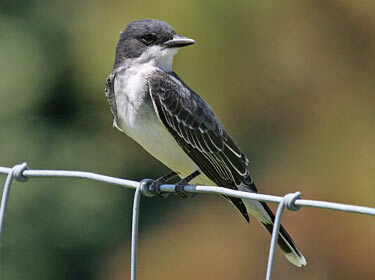 Fun Facts: Eastern Kingbirds are extremely aggressive and territorial birds. They often attacking larger birds and nest predators, such as hawks and crow. The Kingbird earned its name for this feisty behavior.